When I found a flier for this event yesterday on Meserole Avenue I was intrigued, so I shot a photograph of it and looked it up when I got home. Here’s the scoop: one Saturday, October 24, starting at noon an artist by the name Jason Kachadourian will be having a one day installation of this work at a friend’s storefront at 178 Driggs Avenue. 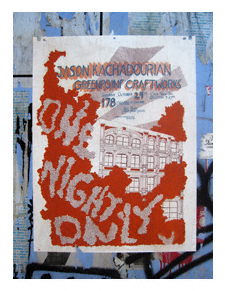 Judging from what I saw on Mr. Kachadourian’s web site we are for a real treat: his work is is absolutely stunning. Check it out! October 24, 2009; noon until 10:00 p.m.